Ben Aronson’s Wall Street Series (2010) steps back from the politics of Wall Street to offer us a real painter’s view of New York’s famous financial district. But, why Wall Street? That famous—or, infamous—street that metonymically stands for finance, money, maybe greed. It’s contemporary shibboleth: it’s freedom; it’s the beating heart of the economy; it’s greed; it’s a symptom of our broken system. It’s as if everyone’s got an opinion; few informedly, few directly. Aronson's jumped into this febrile mix by simply going there, observing, and painting. It’s refreshingly sincere that despite everyone’s opinions and the return of ideologies, someone’s just gone to paint this polarising thing that everyone’s talking about. He’s looking at it with an artist’s eyes: ‘For a painter,’ says Aronson, it’s an ‘incredibly exciting scenario, visually, for paintings in which to present such an emotionally charged inquiry.’ He waxes lyrical of the New York Stock Exchange’s (NYSE) ‘kaleidoscopic lights and screens,’ which made for ‘an amazingly cinematic visual feast.’ Furthermore, his style seems to find an affinity with this strangely intangible industry whose effects are so, well, tangible. It’s weird to think that ‘instruments’ and other such ‘derivatives’ are sometimes more real than reality itself. It’s often suggested that the derivatives market is ten-times bigger than total GDP itself. It’s immensely difficult to capture this strangeness of reality. Aronson puts it, acutely, that Wall Street is ‘something which affects and directs our world every day whether we are aware of it or not.’ He’s often described as an abstract or social realist. In a way, then, there’s this marriage of the abstractions of finance and the concreteness of place, and the concreteness of finance and the abstract quality of its place that’s at work in Wall Street Series. It’s discernible in its style and subject. It's discernible in this strange feeling that they’re similarly, just, on edge. In Volatility Index (2010) there’s the ginormous ‘Stars and Stripes’ that adorns the front of the NYSE. It overlooks the disquieting scene of armed police carrying serious automatic weaponry and one lone businessman in the foreground. He’s in a rush, holding his cup of joe. In a way, it’s a portrait of globalisation through the signifiers: coffee, guns, flags, and finance. In Selling on the News (2010) there’s the juxtaposition of old and new forms of media, the countless palette-scraped computer screens shown alongside the evening newspaper. Of course, Aronson’s series is on Wall Street. He’s certainly attuned, however, to these interesting side-topics too. Aronson’s Wall Street is captured through the artist’s eyes, but also his fine painting. The monitors in Risk and Reward (2010) display a remarkable economy of brushstrokes to achieve their form. Furthermore, you feel you can actually read what’s displayed on the front of them, until you realise they’re just well-placed, but broad, strokes. The Rumour’s (2010) background approaches Abstract Expressionism. I’d like to draw special attention to the mug and keyboard in The Alchemist (2010) which is intricately done, but sits atop an abstract zip that represents the table. It’s all really, really good painting. It’s not easy to approach the topic of Wall Street. It’s always been tempting to ‘bash the bankers’ just as ‘Jesus [once] went into the temple…and overthrew the tables of the moneychangers,’[i] says Matthew. For ‘My house shall be called the house of prayer; but you have made it a den of thieves.’[ii] Since 2007-8, the moneylenders and bankers have been subject to increasing public scrutiny and the media’s spotlight. However, they’re also in the entertainment industry’s limelight with releases such as J. C. Chandor’s Margin Call (2011) or Adam McKay’s The Big Short (2017). Or, Martin Scorsese’s The Wolf of Wall Street (2013) which glamourised the ‘play hard’ ethic of stock brokers—albeit, there wasn’t much ‘work hard’ or ethics in the film. It’s Oliver Stone’s Wall Street (1987) however, with Michael Douglas as Gordon Gekko, which offers us the paradigmatic interpretation of Wall Street. ‘[G]reed, for lack of a better word, is good. Greed is right. Greed works,’[iii] states Gekko. If any artwork truly encapsulates the energy and excitement of Wall Street, however, it’s probably Arturo Di Modica’s immediately recognisable Charging Bull (1989) or Wall Street Bull, which was originally placed on Broad Street opposite the New York Stock Exchange (NYSE) just before Christmas, 1989. The artwork’s website states that this ‘symbol of virility and courage’[vi] was the artist’s ‘antidote to the Wall Street crash of 1986.’[vii] Of course, ‘bull market’ is slang for one that’s rising in price. Di Modica’s sculpture was unambiguously pro-Wall Street. Now, Kristen Visbal’s Fearless Girl (2017) stands “fearlessly” in front of Charging Bull. She was commissioned by State Street Global Advisors, who were promoting an index fund composed only of gender diverse companies. It’s a feminist counterpoint to the very ‘virility’ of Di Modica’s Bull. It’s surely significant that Aronson has approached the financial markets as a figurative artist, and one who’s influenced by social realism at that. It’s significant, then, that it’s taken a representational and figurative artist to capture of something of Wall Street. I suspect that there’s something in the coincidence of the financial crisis of 2007/8 and the ‘return of history’ after Francis Fukuyama’s ‘The End of History?’ (1989) which has always been a favourite in Washington and New York. It’s unsurprising that the ‘return of history’ returns us to ‘history painting’ and its traditional medium in painting. Fukuyama said in ‘The Future of History’ that, yes, history has returned and the markets that we know, love, or hate, their future may well be in doubt. For history has not, in fact, ended. Our contemporary social reality isn’t simply there, it’s supported by loans, credit, mortgages, etc., and finance is, as Aronson says, ‘something which affects and directs our world every day whether we are aware of it or not.’ His paintings intimate this otherworldly Wall Street which structures our very social reality itself. This otherworldly-ness is present, whether in the ethereal glow of the computer monitors in Risk and Reward (2010) or Selling on the News (2012) or the spooky suit whose face is cropped by those suspended computers in Inside the Machine (2010) or the hauntingly unidentifiable Wall Streeters in Conference (2010). Aronson’s Alchemist (2010) is particularly worthy. Firstly, the computer screens: they’re abstract paintings in and of themselves—yet their brushstroke’s perspective is perfect—and their glow hovers just off the material of the screen itself. Now, look at the furthest one—not the reflection that’s ‘outside’ the building, although this is neat attention to detail—the furthest one inside the building displays a news report in finite, yet blurry detail. This is real painterlyness. Moreover, the shades of black and white that form the sheen of the back of the monitor closest to the viewer. It’s immediately obvious that this is very accomplished painting. The New York Times’ (NYT) ‘What Does Wall Street Do for You?’ explains that main function of said street ‘is to perform a sort of financial alchemy,’[viii] as investors want to grow their money, carefully balancing risk/reward but, crucially, access; borrowers ‘want to hold on to the loans for a long time and, sometimes, take big risks.’[ix] The NYT’s point is that it’s the same pile of money that’s at stake and, keeping both investors and borrowers happy requires a sort of alchemy. However, this ‘alchemy’ also recalls George Soros’ famous tome, The Alchemy of Finance (). It’s important to grasp that the ‘market’ and its ‘prices’ is classically understood as allocatively efficient through supply and demand. For e.g., let’s say that ten people (the vendors) are selling ‘widgets’ at different prices ranging for £1 to £10. Importantly, the vendors won’t sell at a loss. So, the first vendor can only sell at £1+ and the second vendor at £2+ and so on. Now, let’s say that there are ten people (the buyers) seeking to buy those widgets. They’re similarly limited to only buying at £1- or £2- and so on and they don’t want to pay more than they must for those widgets. Interestingly, or so the theory goes, the market’s agents will settle on £5 meaning roughly half of those who can sell, will sell, and those who can buy, will buy. For many, the financial markets thus operate through a process of tâtonnement through which its agents discover the just value of any given commodity thus giving rise to equilibrium. Soros’ ‘Free Markets and Equilibrium’ in The Alchemy of Finance dismissed and dispelled the classical model above: It’s now anodyne to ‘criticize the concept of equilibrium…the concept is a hypothetical one whose relevance to the real world is open to question.’[x] For, ‘[i]f there is any place where the theory of perfect competition ought to be translated into practice, it is in the stock market.’[xi] And yet, ‘it makes more sense to claim that markets tend towards excesses, which sooner or later become unsustainable, so that they are eventually corrected.’[xii] Isn’t this what happened in 2007-8 or, say, 1986? So, why alchemy? Soros avers that an investor’s decision to long/short a certain stock is akin to ‘formulating a scientific hypothesis and submitting it to practical test.’[xiii]However, science seeks universal truths whereas investing seeks nothing but the successful ‘return’ on an investment once submitted to the market. ‘The truth is,’ says Soros, ‘investing is a kind of alchemy.’[xiv] For the market isn’t ‘out there’ in the world and discoverable through science. Instead, it’s actually formed of people making daily, conflicting, decisions. It’s for a reason that ‘brokers’ are referred to as ‘market-makers’ as their sales, really, make the very market itself. Now, any broker’s sales (the buying and/or selling of stocks or derivatives) are achieved at a certain price. However, says Soros, these ‘market valuations are always distorted; moreover—and this is the crucial departure from equilibrium theory—the distortions can affect the underlying values.’[xv] He successfully focusses on precisely this distortion, then profits from the resulting change in underlying value by going long/short on that stock. 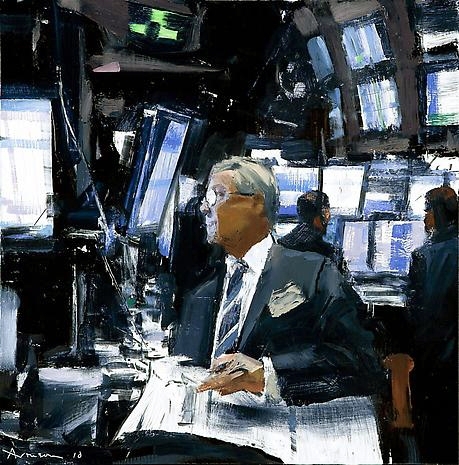 In Aronson’s Alchemist, the eponymous fellow gazes into the computer screens trying to discern the contours and movements of the markets. Crucially, his perceptions of that market serve to structure the reality of that market itself, which then presents itself as an objective reality to its participants. So, to return to social reality and social realism. It’s as if the artist’s blurry faces, abstract brushwork, that yet offer a vivid and realistic image of the street, cause a tension in the viewer. Donald Kuspit, the critic and Distinguished Professor Emeritus at SUNY Stony Brook, states that ‘Aronson is a social realist, like Edward Hopper—but he’s dealing with a different social reality.’[xvi] I’d go further and say that Aronson’s painting is conceptually challenging the very subject of social realism. He, like Soros, understands that ‘reality’ isn’t just out there but is informed by the ways in which its people make it, and are mediated through technologies and the market. It’s a social realist’s reflexive approach to social reality.